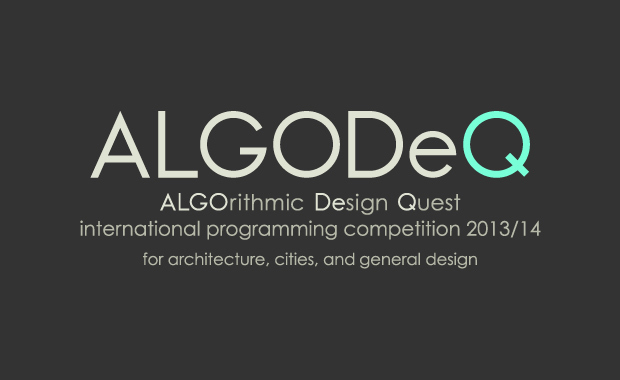 ALGODeQ is pleased to announce that “ALGODeQ (ALGOrithmic Design Quest international programming competition) 2013/2014 for architecture, cities, and general design” has just been launched. A world first, ALGODeQ is a major new competition intended to recognize outstanding achievements in the increasingly influential field of algorithmic design, at the intersection between creativity and computing. The organizers look forward to entries that explore the possibilities of this new and exciting field. One ALGODeQ Grand Prix of 1,000,000 Yen (almost US $10,000), outstanding achievement prizes by category, and subcategory prizes will be awarded. Category for original computer programs created by the applicant that embody algorithmic design. Category for outstanding works of actually built architecture, designed by using an original computer program that embodies algorithmic design and submitted together with the program. Algorithmic design is not simply the use of computers to design architecture. Algorithmic design is the use of algorithms to generate designs that are good and beyond the capabilities of humans acting alone, and the use of computers to execute such algorithms. The competition is open to researchers, architects, designers, planners, system engineers, students, and all others with an interest in the field of algorithmic design worldwide.